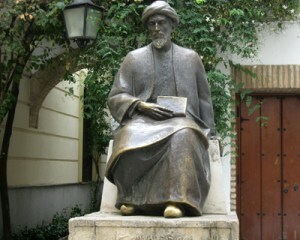 A monument in Cordoba, Spain, Maimonides’ birthplace, honoring its famous resident. So, what does Maimonides have to say about how Muslims view God? Returning to the quote, we see that Maimonides says that “[idolatry] has long been severed from their mouths and hearts.” This, is in fact the same story told in Islam’s view of its own history: before Muhammad, the Ishmaelites (as Maimonides refers to them) in and around Mecca were idolaters. But, since the advent of Islam, “they attribute to God a proper unity.” The Islamic term for a “proper unity” is tawhid, which, in essence, is not just a superficial form of “unity” but a “proper unity” that has an influence on Islamic philosophy and jurisprudence. It is also possible that Maimonides was even distinguishing between the “proper” Jewish and Muslim view of God’s unity and what he would consider the “improper” Christian view of a trinitarian unity. Nowhere does Maimonides even suggest that Muslims are worshiping some different deity or that they do not share the Jewish view of God’s character. Coming very late to this, but one important point. Any verse from the Tanakh which refers to G-d must be understood in light of the specific Hebrew term used. Ignoring this context is why so many outside of the Rabbinic tradition read henotheism into the text.